Reach out to our support team at any time and let us know how much credit you’d like to add to your account, as well as how you’d like to pay. We’ll work with you to get the credit added to your account and will also provide an invoice for your record keeping needs. We require a minimum credit of $250 (and a maximum of $2,000) in order to process these requests – this helps cover our bookkeeping costs and ensures you’ll have plenty of time with the service before needing to top off your credit again. It’s important to note that you will still need to have an active credit or debit card on file with us as a backup payment option. The card will only ever be charged if you’ve depleted your credit or don’t have enough left to cover your bill, so please be sure to keep track of your balance each month if it’s important that your card doesn’t get charged. Reach out to our support team to request our PayPal details – we’ll let you know once the funds are received and credit your account as soon as possible. Reach out to our support team to request our wallet address – we’ll let you know once the funds are received and credit your account as soon as possible. Reach out to our support team and we’ll provide you with the billing details needed to send us a check. We’ll let you know once it’s received and have the credit added to your account as soon as possible. Please note that we can only accept checks in USD, CAD, GBP and EUR currencies. 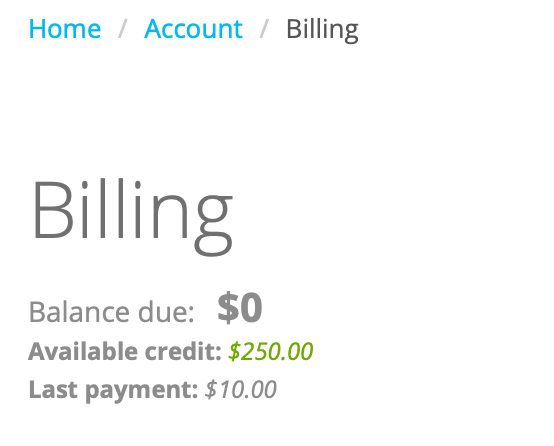 Once you’ve purchased account credit, the balance will be displayed at the top of your Billing page, along with any outstanding payments. Once your credit balance runs out or no longer has enough to cover the current bill, your credit card on file will automatically be charged on the first of the month for the remaining invoice amount. Unfortunately, we can’t issue a refund if the balance is less than $250 USD. A higher balance can be refunded with a 10% handling fee deducted and will be paid back out via a paper check in USD within 60 days.